Dr. Juliana Chang attended the University of Central Florida where she received her Bachelor’s degree in Biology. She then received her Doctorate of Dental Medicine degree at the University of Florida, College of Dentistry. After graduation, Dr. Chang practiced in Orlando prior to moving to Tampa. She has gone on service trips to Jamaica and Guatemala and was a volunteer at the Central Florida Dental Outreach to provide free dental treatment to the under served populations in those areas. She is a member of the American Dental Association, Florida Dental Association, Academy of General Dentistry, and the American Academy of Cosmetic Dentistry. 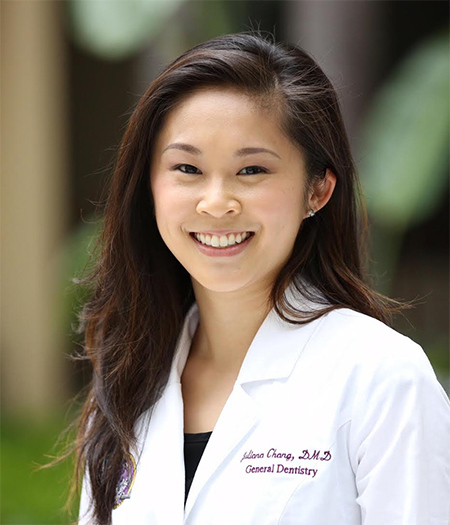 Dr. Chang values the importance of listening to her patients to thoroughly assess their desires, educating them about their oral health, and providing a gentle and comfortable dental experience.